Shiny and new. If you’re into that. Not one to be left behind when competitors start announcing new features, AT&T is touting its new “Next” installment program, which will allow customers to get a new phone once a year — for a fee, of course. This, days after T-Mobile debuted its JUMP system that charges users $10 per month and allows for two upgrades every year. 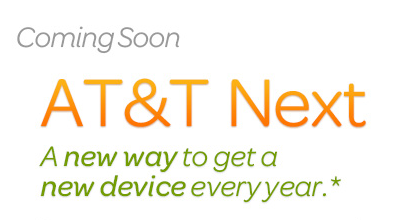 AT&T Next launches July 26, and will let customers buy a new smartphone or tablet once a year without a down payment. You agree to 20 monthly installments when you choose the program, but can trade in your phone for a new one after 12 months. The 20-month clock starts over again at that point. In essence, it’s an installment program which could be useful for anyone who can’t afford a big upfront price but wants a new device. you’ll have to trade in your phone after 12 months, or keep paying for it for 20 months and then the device is yours forever. Unlike T-Mobile’s flat $10 rate, Next’s monthly fees depend on which device you’re using. You end up paying the full cost of the device, just spread out over a few months. This could mean a fee of $15 for one phone, up to $50 for the most expensive available. If you’re low on cash but obsessed with shiny, new things, this might be up your alley. AT&T Brings Back Unlimited Plans. What’s The Catch? Next Does My Homeowner’s Insurance Cover Me In The Event Of A Sharknado? Next Up: Does My Homeowner’s Insurance Cover Me In The Event Of A Sharknado?